Welcome to week 5 of the group reading of Cosmic Trigger. After reading the INTRODUCTION, PREFACE, FOREWORDS, and PROLOGUE, we finally get to PART ONE: The Sirius Connection. A little note on Keeping Together — Cosmic Trigger is composed of some 49 mini-chapters, titled and not numbered, plus some 7 odd “fables.” I will list each week’s reading by titles and page numbers. Because I own the new Hilaritas edition (2016) and an old And/Or Press edition (1978) I will use those page numbers. For simplicity I will refer to them as “new” and “old”. Since the chapters are generally from 3-5 pages in length, with the occasional 9 pager thrown in, it shouldn’t be too hard to locate anything anyone is referring to. 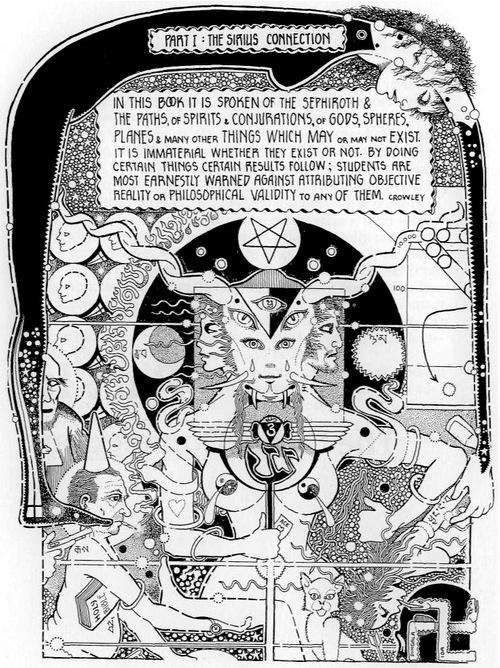 This week we are opening with an illustration of a seminal Aleister Crowley quotation by the exquisite John Thompson. From there we dive into the INTRODUCTORY FABLES and our first two mini-chapters—The Door to Chapel Perilous, and Did a Leprechaun leave the Simonton pancakes. All of this wonderfulness occurs between the pages of 17 and 29 (19-31 old). Second, as a series of themes interwoven in such a way as to Make A World in a way that a simple progressive argument could not. Cosmic Trigger is put together more like a pastiche, a cubist painting, a montage, or a hologram. Of course, the linear tale is one of those themes, the one that serves to provide drama and a sense of propulsion, as well as to lull the rational mind into a sense of safety and “understanding” while the myriad other themes warp and woof their way from one shaggy dog story to another, eventually weaving together a web that can be traversed in any time-space direction one chooses, as often as one chooses, always offering new and unusual perspectives and insights. As a linear process, we begin with the quote from Aleister Crowley in which we are “warned against attributing objective reality or philosophical validity” to any of the models and metaphors to follow, a notion which is re-inforced in the first (How do you know?) and third (You must have a big head to hold a rock that size.) of the Fables that follow on the next page. Of course, this is a theme which we will see a lot of in the pages that follow. We also get our first introduction to 8-circuit theory in the Fable of Ishtar entering Eternity, and of course, we will be seeing more about this as we progress. In Did a Leprechaun leave the Simonton pancakes Bob lines up Peter Pan, Star Trek’s Mr. Spock, Irish leprechauns, Mescalito and a kitchen chair, and notes that they are all products of our human nervous system’s interpretation of the raw data broadcast by Universe, the three-dimensional hologram we call reality. After a long rap which ties together Mullah Nasrudin, Dogen Zenji, Dr. John Lilly, Sigmund Freud and Nietzsche, Wilson lays our interpretation of the world at the feet of The Metaprogrammer, which he declares to be (at this point) a human chauvinist. Thematically, Wilson introduces at least 10 of the myriad ideas that will be repeatedly interwoven with the “story” of Cosmic Trigger. Like Eric Wagner wrote in last weeks comments, “I like that this book has an index.” Here is my list of 10 themes, in order of appearance, along with page numbers and incidences of repeated occurrence. Please do chime in with your own observations. Next week we will dive into The Kennedy Assassination and the Net and A visit to Millbrook, 29-38 new, 31-40 old. p.18 Third paragraph into his personal history and he talks about “coming unstuck in time,” and references a bardoesque, time-travel SF classic, “Slaughterhouse 5,” in connection with a state Sufis call ‘waking-up’ – “…a sudden awakening to the divinity of all things. p. 18 – 20 He mentions the number 30 three times – the age he starts psychedelic experiments, the rent of his cabin and land – his home, and “30 acres of wood to seek Mystery in.” I suggest that he refers to key # 30 in 777’s Table of Correspondences. 30 corresponds with the Sun and ‘Head.” He just wrote: “You must have a big head,” in the Zen fable. The King Scale of Color for 30 = Orange. He uses an orange a few pages later (p.27) as an example to demonstrate color perception. The Queen Scale of Color for 30 = yellow as in Yellow Springs, Ohio which, incidentally, seems quite an ironic hometown name for someone beginning to embark upon psychedelic research and about to delve deeply into Crowley’s Magick system. I was growing up in Cleveland, Ohio at this time and was familiar with the old riddle, “what’s round at both sides and hi in the middle?” Yellow corresponds with 30 also due to the connection with the Sun. Yellow Springs, Ohio. The Sun links to Tiphareth. All beginning magick is to be directed to attaining the Knowledge and Conversation of the Holy Guardian Angel, according to Crowley. All other magick is black magick, he says. This operation occurs in Tiphareth. Key 30 could indicate someone following this plan especially as the Hebrew phrase “It will be,” transposes as 30 by Gematria. That phrase connected to the Sun and Tiphareth suggests an aspirant with a positive attitude – see the end of CT re: the final secret. 30 corresponds with the Egyptian Sun God Ra pronounced RAW a pun RAW played up one time in the online Crowley class. The first time 30 is mentioned it’s associated with ‘nuclear power plants” which seems quite the pun if you take this qabalistic nonsense seriously. RAW hadn’t yet been introduced to Crowley’s methods but he just brought up coming unstuck in time so it seems likely that he could be playing around with time with his references. Bringing up Tiphareth so soon in CT follows the shamanic voyaging principle that before going anywhere you must first travel through the heart of the labyrinth (Tiphareth) because that’s connected to everything else – see Tiphareth on a diagram of the Tree of Life. Cosmic Trigger as a book = a shamanic voyage. p. 19 -20 – “… I had rented the cabin from Antioch College for $30 per month and had an acre of cleared land to grow food on …” I wonder if that’s when he first began experimenting with growing that rare strain of quod fugit lasagna he became so fond of? Awesome commentary Oz--you always point the arrow straight at the bullseye! I love the 30 references..must acquire a copy of 777 asap. Thanks for pointing out the sentence from page 24--I included that in my thematic key under Metaprogramming. So glad to have you contributing to this reading! Thanks Chas! Great synopsis as well. I recommend getting a hard copy of 777, but most of it can be find online too. Don't know if anyone is doing the math, but 40 trips in 6 months appears quite the rigorous research schedule. Especially when holding down a job as "Assistant Sales Manager for a microscopic business." The quoted phrase seems another pun when realizing that Leary described psychedelics as like applying a microscope to consciousness. Leary was definitely involved in Publicity and Sales for that kind of microscopic business and it could be considered that RAW assisted him. In "The Door to Chapel Perilous" chapter it occasionally seems like RAW uses qabala associations to communicate strategies for getting through CP. Bob signed the first letter he sent me "Live long and prosper" back in 1986. I had forgotten he mentions that expression in Cosmic Trigger. I read this week's portion while listening to the fourth movement of Beethoven's Ninth Symphony, as I did with last week's Torah portion. The image on page 30 (New Falcon) makes me think of the Holy Grail. The Door to Chapel Perilous introduces many of the main themes of this work. Personal mystical experiences are updated using modern scientific language which to me is one of the main goals of RAW and Leary' s work. The connections Wilson's makes between different models is so entertaining to explore and consider. How could you remember the Master who makes the grass green when Dr. Spock is delivering pancakes? The Sufi fable reminds me of General Semantics and the "map is not the territory." Thanks for pointing out the correlation between the Babylonian fable and the 8 circuits. It helped me understand it differently. The final Zen story makes me think about neurologic, and how all we know is the signals after being interpreted by our nervous system, but the Roshi's response seems to be a joke about ego. Thanks, Eric, I hadn't seen that. Master Sgp, what the hell are you talking about? What part of the Chapel are you from? "My Back Pages," by Bob Dylan is the first song on my CT playlist. It starts with fire signs, references Chapel Perilous and "using ideas for my maps." Time flips on the chorus and he even mentions Sirius. I realize RAW probably wasn't a fan, it just seems relevant to me when similar information arrives from different sources. The Vogel experiment (pg.25 old) reminds me of Masaru Emotos's famous experiments with directing intent at water, which supposedly had powerful results. I was reading just the other day about Gurdjieff's theory of alchemy that suggested that *all* substances have an essence and a vibration, be it animal or vegetable and even mineral. I admit it's a fair leap from accepting that plants carry and respond to vibrations to the possible suggestion that rocks, metal, crystals or water do as well. 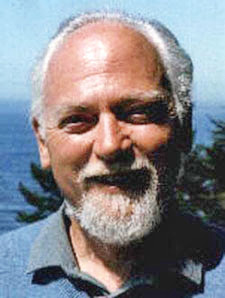 Thomas Lethbridge did a series of books on parapsychology, and studied using pendulums of differing lengths to ascertain certain vibrations. He found, for example, that silver vibrated at 22 inches, sulfur at 47 inches and so on. He carefully worked out that emotions carried vibrations as well, and the lengths they corresponded to. Most astonishingly, he also found that sling rocks recovered from an old Iron Age fort had distinct vibrations at 40 inches, the length that corresponded to anger. Rocks he recovered from a nearby beach had no such vibration. When I got out of college, I moved to Lawton, Oklahoma, to work at the newspaper there. Its the area where Quanah Parker lived much of his life. RAW is mostly accurate about Parker, but he does get one thing wrong — Parker was a famous Comanche, not a Cheyenne. Antioch College at Yellow Springs is of course the school that Simon Moon went to --in Illuminatus! Moon talks about his experiences there. So this is also a look into Simon Moon's "Back Pages." Part One: The Sirius Connection. The quote from Crowley, perhaps rewritten into a more generalized form, should be required to be printed at the beginning of all religious and political tracts. From the Sufi: I agree with Dustin (11 May @ 0704) about the General Semantics reading of this story. The map is not the territory; the territory is the territory. The Door to Chapel Perilous. 1. Becomes an atheist at 14: perhaps helped by the non-event of his first communion, Confirmation being the RCC’s puberty rite? 3. 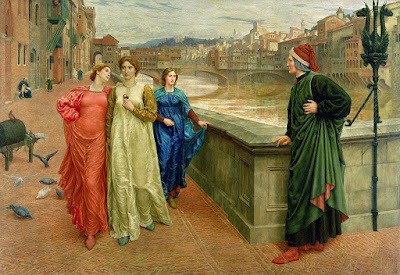 Drug experimentation starts at 30: almost at Dante’s “Midway in our life’s journey”. Aldous Huxley: Brave New World was published the year Wilson was born. The Kennedy Assassination: The period between 1963 and 1975 in our history reminds me too much of the period between ca. 1928 and 1938 when the Militarists took over the Japanese government by a series of political assaults – including the murder of one prime minister – and coup attempts. Oz—I give up…where is the Sirius reference in my back pages? Dirtydiscordia—It might be a further leap to suggest that rocks, metal, crystals or water don’t carry and respond to vibrations, after all our computer technology is built on the vibrations of sand. Giordanista—funny that you mention Huxley and Kennedy in adjacent lines.